Surprisingly, this is the first TRANSFORMERS: AGE OF EXCTINCTION post in a long time. There's really been very very little information revealed about the movie so far beyond the fact that there will be Dinobots and cars that turn into robots. "As humanity picks up the pieces, following the conclusion of TRANSFORMERS: DARK OF THE MOON', Autobots and Decepticons have all but vanished from the face of the planet." "However, a group of powerful, ingenious businessman and scientists attempt to learn from past Transformer incursions and push the boundaries of technology beyond what they can control - all while an ancient, powerful Transformer menace sets Earth in his crosshairs. The epic adventure and battle between good and evil, freedom and enslavement ensues." Now we have our first teaser trailer for the movie. Check it out after the break. After going through this routine four times, I really can't say much about this. It looks exactly like the trailers for DARK OF THE MOON. You have a blonde chick looking terrified, spaceships, a fight scene in a crowded city, and just as a call back to the second movie we even have Optimus being hurt what looks to be fatally. Also, the whole "Optimus riding Grimlock" thing sounds way better in concept than in execution. I think I've hit my breaking point with this franchise. 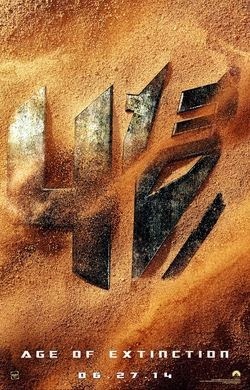 TRANS4MERS: AGE OF EXTINCTION is directed by Michael Bay, it stars CGI robots, Mark Wahlberg, Nicola Peltz, Jack Reynor, Stanley Tucci and Kelsey Grammer, it comes out in wide release June 27th, 2014.